Revolax Deep with Lidocaine is an ultra-volumizing dermal filler that is produced by Across, a pharmaceutical company based in South Korea. This company was established in 2009 and since then has manufactured various products, such as medical devices, medications, and health foods. Revolax Deep with Lidocaine is a cross-linked hyaluronic acid-based intradermal filler that is completely synthetic, tissue friendly, and biodegradable. It is formulated with 24mg/ml of densely reticulated hyaluronic acid gel and is integrated with 0.3% lidocaine, which helps to alleviate the pain and discomfort caused by the minimally invasive injections needed to deposit this filler in the skin. The hyaluronic acid molecules are of bacterial origin and are extensively purified to contain undetectable level of potentially harmful bacterial endotoxins. Additionally, the hyaluronic acid molecules are chemically cross-linked into a viscoelastic gel with monophasic and polydensified texture. This filler instantly plumps the corrected areas, resulting in harmonized volumization of skin. This aesthetic implant is specially designed to target deep wrinkles, such as nasolabial folds, and to non-surgically augment facial elements like the nose, lips, cheek, and chin. This sterilized medical device has a shelf life of 24 months, which can be maintained if it is stored in a safe place where the temperature is between 2 to 25℃. 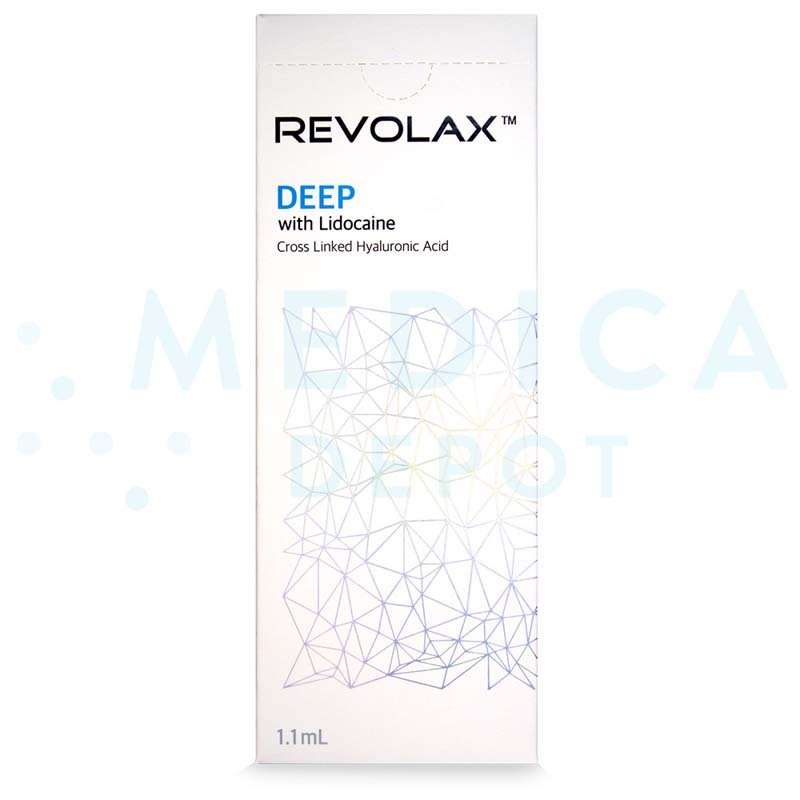 If you are a certified medical practitioner looking to stock up on Revolax Deep with Lidocaine and other cosmetic injectables, you can do so at www.MedicaDepot.com. Register an online account today to enjoy the many membership benefits, such as wholesale prices, discounts, free shipping for orders above $250, and continuous customer service support. 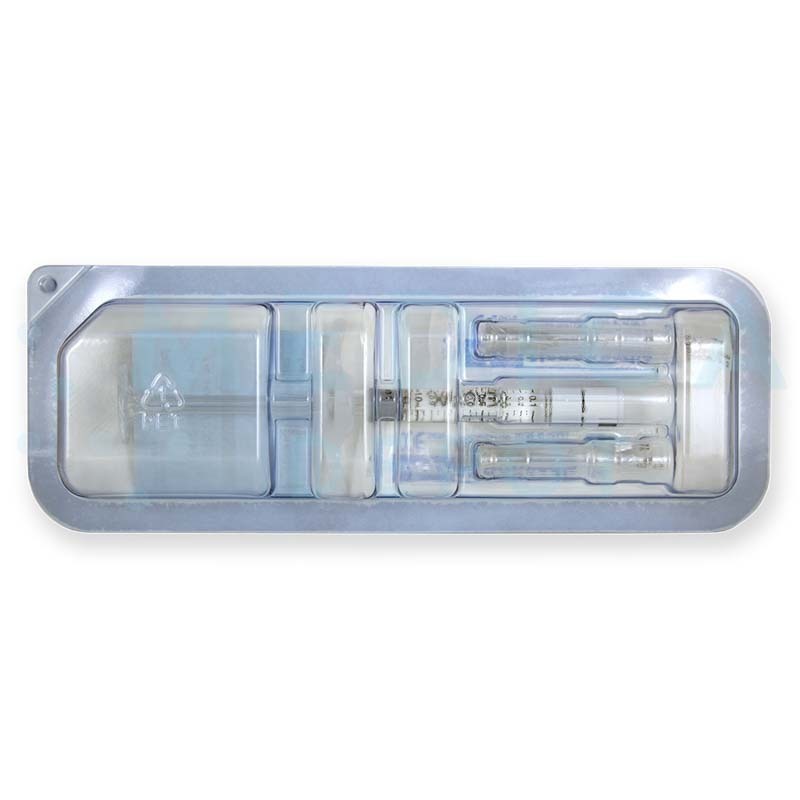 Each box of Revolax Deep with Lidocaine comes with a single 1.1ml prefilled syringe, 2 sterilized and disposable 27G needles, and a package insert. Revolax Deep with Lidocaine is a high-quality dermal filler that contains only highly pure hyaluronic acid molecules. Though the molecules are harvested from the biofermentation of Streptococcus zooepidemicus bacterial cultures, they are filtered and purified to contain less than 1.2IU/ml of bacterial endotoxins. Not only that, even the level of residual chemical reticulating agent used—1,4-butanediol diglycidyl ether (BDDE)—is undetectable. Furthermore, cross-linked gel has a monophasic and polydensified texture, which enables it deliver long-lasting and harmonious skin volumization. Once injected intradermally, this viscoelastic filler gel instantly reinforces weakened skin structures. The regular and dense patterned lattice of the gel allows the filler to volumize depressed skin for an extended period of time. This skin-sculpting filler is made of 24mg/ml of hyaluronic acid molecules that are cross-linked through the use of BDDE during the manufacturing process. It also contains 0.3% of lidocaine to reduce pain associated with the injection process. The levels of bacterial endotoxins and residual BDDE in this filler are undetectable since the filler gel is purified thoroughly before it is packaged for use. How to inject this product? During the pre-procedural consultation session, review your patient’s medical history to ascertain their suitability to receive this nonanimal-based hyaluronic acid filler. Assess their aesthetic imperfections and determine the appropriate treatment goals. Once they are ready, commence the treatment session by cleaning and sanitizing the proposed treatment region(s). Administer an additional anesthetic agent if necessary. Next, inject the filler into the mid-to-deep dermis or subcutaneous layer of the skin. You can use this aesthetic filler when your patients are concerned about deep-set facial wrinkles, such as nasolabial folds and laugh lines. The highly viscoelastic property of this filler also makes it ideal for augmenting facial contours like the chin, cheek, nose, and lips. It is important that this filler is not implanted concurrently with other aesthetic treatments like chemical peel, laser therapy, and dermabrasion treatments. Revolax Deep with Lidocaine corrects deep-set facial wrinkles, such as nasogenian furrows and laugh lines. It can also be injected into the nose, lips, cheek, and chin to augment their shape and size. Patients should be able to notice the beautiful aesthetic improvements of this filler once the initial injection site reactions have subsided. These effects should last for about 12 to 18 months until the filler gets metabolized away into the neighboring tissues. This long duration of action is made possible by the extensive and dense cross-linking between the hyaluronic acid polymers. The dense lattice and cross-linked structure protect the filler from being disintegrated prematurely by enzymes and reactive free radicals. However, the exact residence time of this filler when it is injected is influenced by patients’ physiological factors (e.g. age, lifestyle, health status, and skin condition, etc.) and the amount of filler injected. Patients are advised to get annual touch up injections to retain the effects of a Revolax Deep with Lidocaine injection. 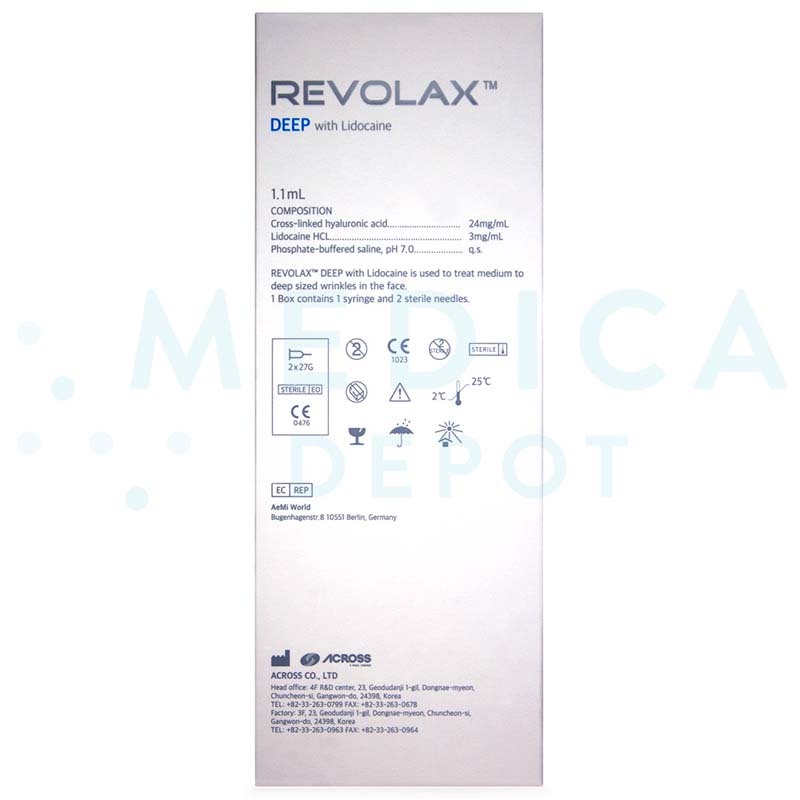 Revolax Deep with Lidocaine is ideal for patients with deep-set wrinkles, such as nasolabial folds and laugh lines. This viscoelastic filler is also ideal for patients who want to have certain facial features like the chin, nose, lips, and cheek non-surgically augmented. Purchase this high-quality dermal filler to easily correct deep-set facial wrinkles in your patients. You can use this cosmetic injectable to treat patients who want to augment their facial features without undergoing a surgical procedure. Additionally, since Revolax fillers, including this one, are accredited with the European Medical CE, you can use these products confidently. Patients may develop common injection site reactions, such as redness, pain, bruising, and swelling after the treatment session. These inflammatory reactions are usually mild and transient. Always read the package insert for more information on possible side effects. Educate your patients on these side effects so that they can obtain quick medical care, if necessary.